Joe Dombrowski (Haymarket Bicycles/HomeVisit) may only be eighteen years old but he has already made his mark on the Mid-Atlantic cyclocross scene. He currently leads the MABRA ‘Cross series in the elite category and is coming off a nice win at last Sunday’s Tacchino Ciclocross at Rosaryville State Park, Maryland. 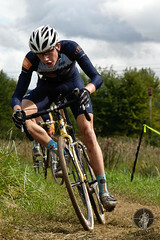 Joe only started racing cyclocross in 2008, coming from a mountain-biking background to the road. Although his time in the sport may be short, he has crammed in a whole lot of experience in that time. This includes a two-week stint of Euro-style cross in Belgium, where he raced against some of the best young ‘crossers in Europe. I talked with Joe about racing, training, and his experiences in Europe. Here’s one takeaway for those among you that are easily offended by a slight touch of wheels or getting squeezed off your line. That ain’t nothing compared to Belgium. As Joe explains below, if you aren’t chopping, elbowing and shoving, you’re just not racing. You come to cyclocross from an MTB background; do you consider either discipline your primary focus? At this point, I think I am a little to young to specialize in anything. However, I think I will probably focus more on road and ‘cross in the future. The switch to the road would be purely because of support; there are not nearly as many opportunities in mountain bike racing. What do you think your strengths are as a cyclist? Do you think this favors MTB over ‘cross or vice versa? I definitely excel at climbing, particularly on the road. This is probably more beneficial to mountain bike, and some road racing than cyclocross though. Unfortunately bike racing isn’t all uphill time trials. Do you participate in any other sports? Did you during high school? I played lacrosse the first two years of high school and then decided that I wanted to focus on cycling. You spent time in late 2008 at the USA Cycling Euro Cross Camp. Tell us a bit about that experience. I know the racing is much more aggressive. Did you enjoy that style? Euro Cross Camp is definitely the most fun and effective period of racing that I have ever done. We raced 6-8 times in 15 days in some of the biggest ‘cross races in the world. The racing is much more aggressive. For example, here in the MABRA, it’s not exactly kosher to chop someone in a corner and run them into the tape or use your hands to push someone down a run up. In Europe, that’s all fair game. It’s fun in an initially intimidating and awe-inspiring kind of way. What is the biggest lesson you learned from racing in Europe and how has that helped you going forward? I would say that I got a good idea of where I am as a rider. European racing is very condensed; the best guys in the world are consistently showing up at the biggest races in a relatively small area. Think Sven Nys showing up at every MABRA race. While I was over there, I was consistently racing against kids that would be top ten at the Worlds; it just gives you an idea of where you stand in the bigger picture. Do you plan on going back this year? We’ll see. At 18, I am a first year U-23, so I have four years of development within that category. I’m definitely not going to Worlds this year so I am thinking it might be better to chill out and focus on the future. If you could make cycling a career is that something that interests you? Have you thought about where you may want to be in ten years and if cycling plays a part in that? That’s definitely my dream! I want to avoid a real job for as long as possible! I’m a freshman at George Mason University majoring in Economics. Ideally, I will be able to make a career of some sort out of cycling, but I would like to do something economics related someday as well. What’s your daily routine like? You’re in school, do you also work? When do you fit in the training? I live at school, and knock out all my classes pretty early… I’m either done by 9:00 a.m. or noon everyday. This leaves me most of the middle of the day to train. During the season, I am not working, but I will probably go back to my job at Blue Ridge Mountain Sports during the winter and summer breaks. What does a typical training week look like for you during the ‘Cross season? Pretty light in comparison to the MTB/road season. With the training intensity required for ‘cross, and often times racing both days on the weekend, the focus is sometimes more on recovery than training. The meat of my weekly training is Tuesday/Wednesday/Thursday. I incorporate intervals on Tuesday and Wednesday, with a longer endurance pace ride on Thursday. The intervals are short and intense as I rely on the threshold work I do during the summer as my base for more intensity in the fall. On my easy days, I usually spin lightly or do some ‘cross specific drills. I know that you also do plyometrics during the season. How many times a week and what does that involve? I’ll do plyometrics once or twice a week. I think the fast, powerful movements are particularly beneficial to the on/off nature and severe accelerations of cyclocross racing. I do frontal and lateral box jumps as well as box push-offs for the lower body, and medicine ball and plyometric pushups for the upper body. Do you do any running as part of your ‘cross training? It may be kind of silly, but I run with the bike once or twice a week. Take us through a typical race day. Let’s say it is a race less than two hours from home. I usually eat a big breakfast, and eat small portions up until about two hours before my race. If I race later in the day, I try and spin very lightly in the morning. I’ll get to the venue two to three hours before the race. I try to get as many laps on the course as possible, and then finish my warm-up on the trainer. In the 1/2/3 field you are typically racing against guys nearly twice your age. Is that in anyway a factor? Fitness-wise, I don’t think it has too much of an effect. But I do cue off of some of the more experienced guys in the races, i.e., taking bike changes, following lines. This may be a silly question since you obviously can hang with anybody during a race but do you feel like you have to prove you belong because of your age? Not really, but I definitely take a little bit of pride in whooping up on the old guys sometimes [laughs]. You’ve had a lot of great results this year, what are you goals for the rest of the season? Well I hope to have a good ride this weekend at Mercer Cup, and hopefully pick up some UCI points in Hendersonville the following week. Beyond that, things are kind of up in the air. Last year I raced through early January, but it might be good to take it a bit easier this year. 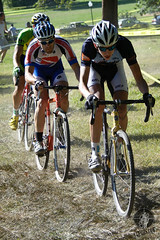 This past Sunday you won the Tacchino Ciclocross and your teammate Jared Nieters came in third. Do you and Jared talk about strategy before races? If so, how does that conversation usually go? Yeah, we do. We usually evaluate the course and decide what sections suit our individual strengths. Ideally, we will be together, and work together, to our mutual benefit. Take us through the decisive moments of the race. You ended up with a nice win, did the race play out the way you expected? The race actually didn’t play out at all as I expected. I thought the course was going to keep the lead group large throughout the race. I figured Wes [Schempf] and Andy [Wulfkuhle] would ride team tactics, and there was some of that in the first few laps, but not later on. I also thought that Greg Wittwer would be a major threat; I think those guys had rough days. Jared was actually the one to really break up the group. It eventually got down to Jared and me, Steevo Cummings, and I think Dave Weaver. I got off the front, and Jared sat on. From there on out, it was pretty much a time trial. Are you heading up to Jersey this weekend? If so, what are your expectations? No real expectations. I currently have zero UCI points, so my call up is probably going to hurt a little bit. I just want to work my way up and get a good result in the U-23 standings. Anything else you would like to add? Give a shout out. Thanks to Josh and my Dad for supporting me from the pit, Jared for riding like a teammate, and Haymarket Bicycles for being the best shop around. Oh, to be 18 again! Congrats, Joe. I look forward to following your cycling career for many years to come. I concur with Jay…It will be very nice to watch MABRACrossers make their runs at the top rungs of the sport!